This week we will be looking a HUGE seabeast! Make way for Shonisaurus popularis! Shonisaurus was an ichthyosaur, in the same group as the more famous, Ichthyosaurus. Like it's relatives, Shonisaurus' body was shaped similarly to that of a fish, despite the fact that it was an air-breathing reptile. (This evolutionary strategy would pop up again, millions of years later with mammals in the form of whales.) Shonisaurus stands out because it was so large, measuring about 50 feet from snout to tail as an adult. It lived in the ocean that covered what is now Nevada, in the USA, during the late Triassic Period, about 215 million years ago. The name, Shonisaurus, translates to "Shoshone Mountain Lizard" in reference to the mountains in which it was found. When alive, Shonisaurus would have eaten mollusks and fish. Shonisaurus was an earlier form of ichthyosaur, so it did not possess all of the telltale characteristics you might see in later, more famous kinds, like Icthyosaurus. 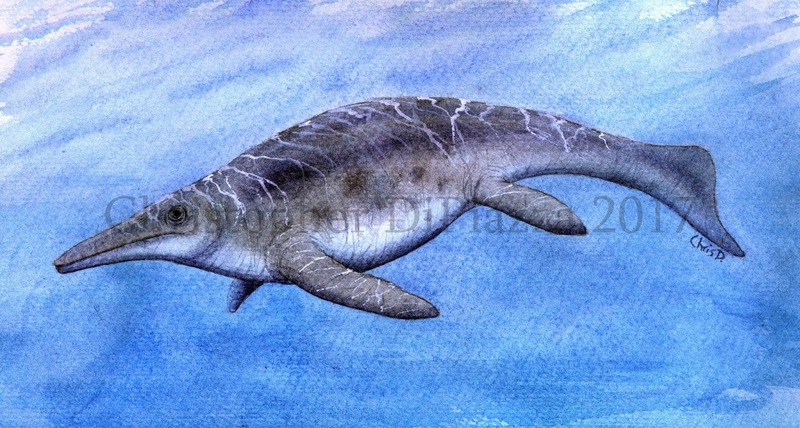 For one thing, Shonisaurus presents no evidence of having possessed a dorsal flipper when alive, nor a full tail fluke. So it wouldn't have had the distinct tuna-like profile other, later ichthyosaurs had. Its lower flippers, that had evolved from walking limbs of its ancestors, were relatively long and narrow, while later relatives had more rounded ones. One feature it had that did pass on to the rest of the ichthyosaur group was the fact that it had exceptionally large eyes, even proportional to its immense body size. This suggests that Shonisaurus could see where there was little light, and may have spent at least part of its time in very deep waters. 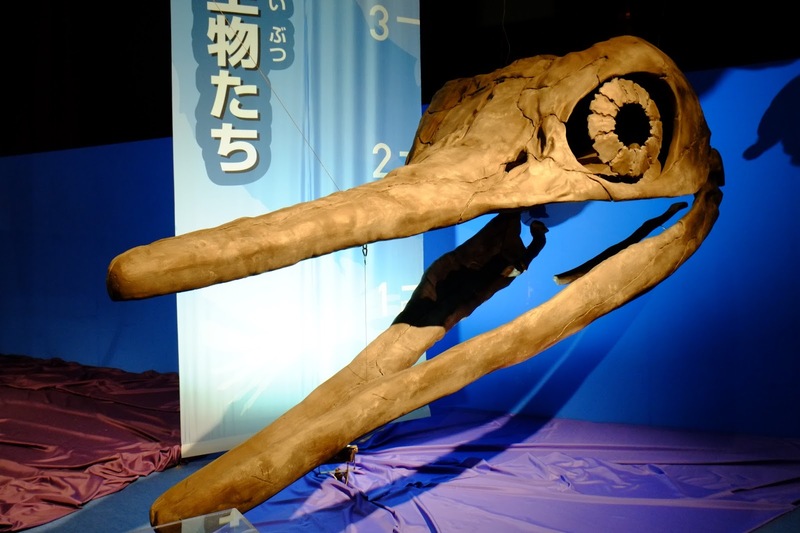 Shonisaurus skull cast on display at the 2015 "Mega Dinosaur Exhibition" in Tokyo, Japan. Shonisaurus was large. It was one of the largest marine reptiles known to science, in fact. So what and how did it eat? Well, luckily, along with over thirty adult skeletons on the fossil record of this beast, paleontologists have also identified coprolites (fossilized poop) from it. Turns out, according to the poop, Shonisaurus was eating squid, belemnites (like a squid but with an internal shell) and soft fish. Interestingly enough, however, these prey items were all small, so it means that Shonisaurus must have been devouring huge quantities of them in order to grow and stay alive. In order to better understand this, we can take a look at modern marine giants that prey on small animals. Balene whales come to mind first, but as their description suggests, they had balene, an adaptation that helps them devour krill and other small prey in a very specific fashion. Shonisaurus had small, almost nonexistent teeth that faced somewhat sideways in the mouth. In fact, it appears that Shonisuarus' lineage was on its way to doing away with teeth altogether. (Which makes sense since there are many kinds of later ichthyosaurs that were toothless.) I feel an even better modern analogue than whales would be the Basking Shark and Whale Shark. These two kinds of sharks, in addition to also being very large, have no teeth in their mouths, but they can open them extremely wide as they filter feed on small prey. Having been a reptile, Shonisaurus would have been able to open it's jaws relatively wide, as well, and could probably achieve similar feeding feats. Kosch, Bradley F. (1990). "A revision of the skeletal reconstruction of Shonisaurus popularis (Reptilia: Ichthyosauria)". Journal of Vertebrate Paleontology. 10 (4): 512–514. Mcmenamin, Mark A.s., Meghan C. Hussey, and Lydia Orr. "Ichthyosaur Coprolite With Nautiloid: New Data On The Diet Of Shonisaurus." (2016): n. pag. Web. Nicholls, Elizabeth L.; Manabe, Makoto (2004). "Giant Ichthyosaurs of the Triassic—A New Species of Shonisaurus from the Pardonet Formation (Norian: Late Triassic) of British Columbia". Journal of Vertebrate Paleontology. 24 (4): 838–849.